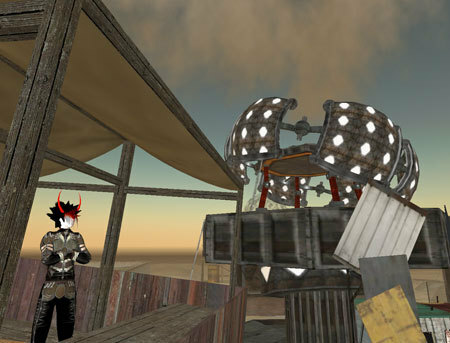 Second Life tends to be full of bling. Even the more grim RP communities can't resist dipping their dog-collars in chrome and shining their samurai swords. After awhile this can all start feeling like a shiny happy Barbie landscape, and you need to get out. You need to go where things have truly, irrevocably fallen apart. Sometimes you need to go to the Wastelands. Welcome to the post-apocalypse. Estimated Number of Players: Two simfulls. Gameplay: Scrape, scavenge and survive in the post-apocalypse. Top Qualities: Very unique, cheap HUD, nice and quirky players. Current Shortcomings: Extremely competitive (although RP is optional), land is always sold out, a bit bleak for some. 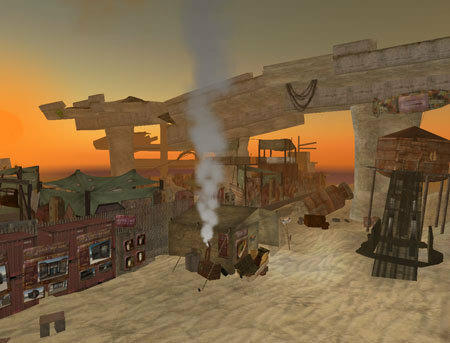 When I first teleported into "The Junkyard", the second of the two sims that make up the Wastelands, I wasn't sure why I was there. Hamlet had sent me the landmark without an IM, and I didn't even realize that it came from him at all. Standing on a broken highway I looked around at the dirt and corrugated metal shacks and wondered what the hell I had just stumbled into. For reasons that I discovered later the residents of the sim were always on the move. Odd characters adorned in gas-masks and dusty leathers raced up and down the crumbling avenues, but I couldn't yet tell if they were running from something or hunting something down. The buildings here, while frequently designed to look assembled from trash, really had style. You couldn't call any of it beauty, but there was a certain something about it that puts the visitor in a "Mad Max Beyond Thunderdome" frame of mind. Notices were invariably spray-painted, and hazard signs dotted the landscape. This community has done a fantastic job of building a sim that is seemed like it was struggling to survive. I was soon to discover that struggle and scarcity were the hidden charms of the place. Eventually I found an RPG at play here. A L$100 HUD puts you right into the game with an interesting system for managing damage-over-time (dot). Radiation, Fire, Acid and Poison all cause various amounts of damage over various amounts of time, and you'll need special in-game items to save yourself from encroaching death. Weaponry is strictly restricted to an approved set, and if you try to fly your HUD will kill you. This last point explains a number of things I noticed around the sim. Since there's no flying, barbed wire fences are effective deterrents now and present interesting challenges to would-be trespassers. Defending one's land rights becomes a critical issue because of another unique feature of the sim: salvaging. Randomly around the sim crates appear containing salvage material. This material can then be processed to create game items, which in turn make you a more dangerous character. This is why I spotted residents running around the sim earlier - they were looking for crates randomly appearing across the landscape. Apparently squabbles break out between various factions over salvage rights, and much of the game play revolves around scarcity. 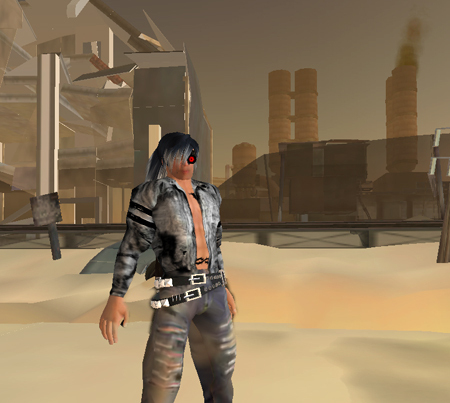 The interesting thing here is that NeoBokrug Elytis, the sim's creator and owner, hasn't created a story for the world at all other than "it's post-apocalyptic". Instead, they've set up a system for people to interact, given them a setting, and asked them to come up with their own stories. Since people tend to want to build up groups in order to carry on salvage activities, they build interesting places and create elaborate mythologies for themselves to attract new members. In short: NeoBokrug built the system, but the players build the game. The response has been very positive. The entire Wastelands sim sold out before it was purchased, and a second sim's reserve list filled quickly. Now that the second sim has been built and filled, a reserve list for a third planned sim is well on its way. A team of 8 volunteer developers are in the planning stages for this new expansion, and the community is eagerly awaiting the construction of a new place to salvage goodies. What I loved the most about the Wastelands, though, was how friendly everybody was out here in the dirt. Nobody was brandishing arms or trying lame, intimidating roleplay. 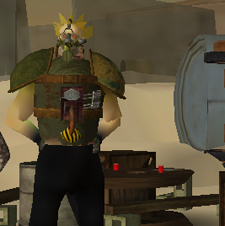 Somehow, even though this was the most competetive struggle within an RPG that I've witnessed anywhere, the players were all very interested in being nice to outsiders. Maybe role-playing scarcity reminds people of how much we all need each other and how little the bling really matters. 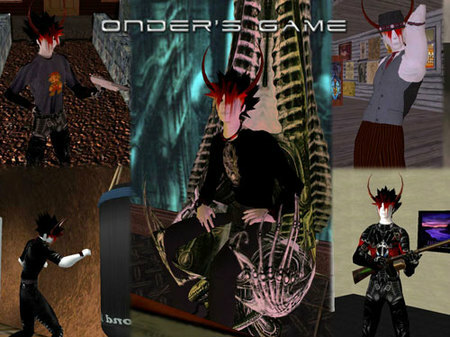 Onder Skall writes about SL games on his own blog, and continues to cover them for New World Notes. To tell him about a Second Life game, IM him in-world, or e-mail ruagamer at gmail dot com. Have to say, Wastelands is one the the best sims I've seen, in terms of using SL's means of expression to reach a certain goal. The ambience of a post-apocalyptic, well, wasteland, is so good I had the same feeling of being immersed as I get from playing a well-laid out FPS like Call of Duty or Halo - this, I believe, is not accomplished by any means of realism (i.e. photorealism) but by cleverly utilizing the means at your disposal. 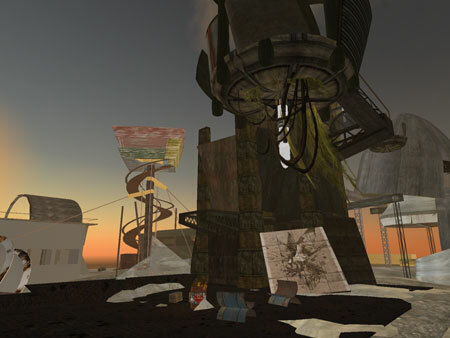 The Wastelands (and the associated areas such as the Junkyard and Great Fissure) is one of the most impressively designed Second Life sims I've ever seen, really illustrating what one can accomplish within the limits imposed by Linden Labs' virtual space. I've had a few very entertaining evenings poking through the wreckage and conversing with the strange inhabitants. I only wish the roleplaying contingent was larger than it is and got together more often - unfortunately RP encounters are few and far between, so rare that one can hardly call Wastelands an "RPG" sim. It's too bad because I'd love to RP in this post-apocalyptic world and the basic game 'hook' (fighting over salvage) seems to offer a nice mixture of simplicity, freedom, and motivation. I hope it becomes more popular.